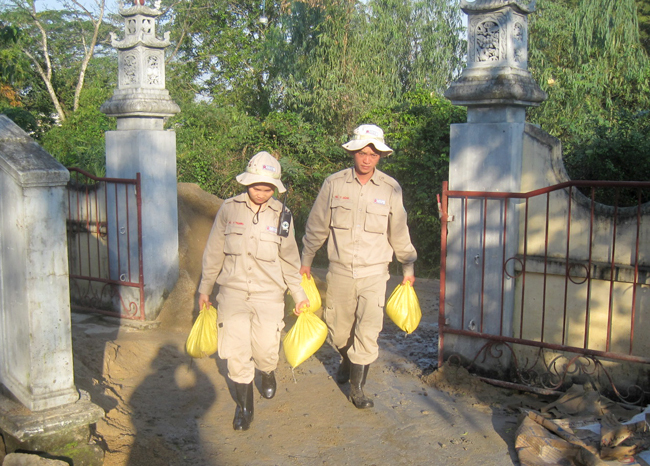 In the first week of the New Year 2015, 160 items of unexploded ordnance (UXO) were safely removed by RENEW’s mobile Explosive Ordnance Disposal (EOD) teams from people’s gardens, rice fields, plantations and roadsides in two districts of Quang Tri Province, Cam Lo and Trieu Phong. Most of the munitions, 141 of them, were destroyed thanks to the alert awareness of local people who have become the “eyes and ears” of RENEW EOD teams over the years. Using Project RENEW’s toll-free hotline telephone number, 355411, local residents called 24 times last week to report UXO discoveries to Project RENEW teams. Five items of UXO, including one mortar, one hand grenade, two 40mm grenades and one projectile, await demolition in An Thai Village of Cam Tuyen Commune after RENEW’s EOD Team No. 3 responded to three UXO callouts on 5 January 2014. Last Tuesday in An Hung Village, members of the Le family were renovating the temple for the upcoming Lunar New Year festival when they suddenly found a cluster bomb, locally known as a bombie, adjacent to the structure. Mr. Le Van Thuc picked up his cell phone and immediately reported the sighting to RENEW. Half an hour later, a RENEW EOD team arrived and safely destroyed the bomb in place. EOD team members preparing for safe disposal of the cluster bomb found near a family temple in An Hung Village. The same day, Tran Huu Ha, a Youth Union officer in Cam Hieu Commune, ran into two youngsters who were collecting wild vegetables. They had found some UXOs they were trying to dismantle. Ha stopped them immediately. “I know how dangerous these unexploded projectiles are,” he said. “They are very unstable and may explode if disturbed, so I asked the boys to stop and I called Project RENEW immediately.” Ha is a member of RENEW’s Community Reporting Network which educates people about UXO risks and encourages them to report UXO sightings to RENEW for timely and safe removal. 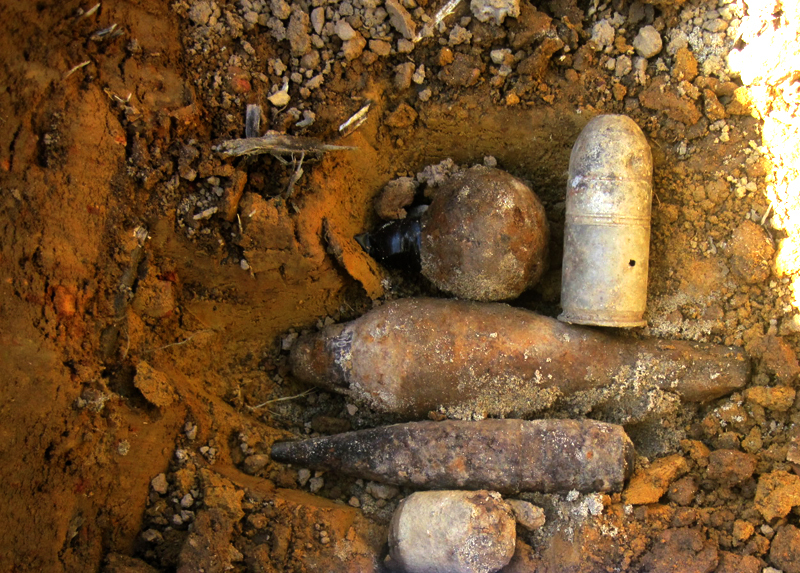 EOD Team Leader Duong Duc Tam coordinated with Ha and followed his directions to the site of the munitions, where they found a cache of unexploded projectiles, some of which had been unearthed by the two boys who thought they might sell the scrap for extra money. A total of 105 items of 37mm projectiles which RENEW’s EOD team determined were stable enough to move, were safely transported from the location of this cache to RENEW’s central demolition site for later destruction. 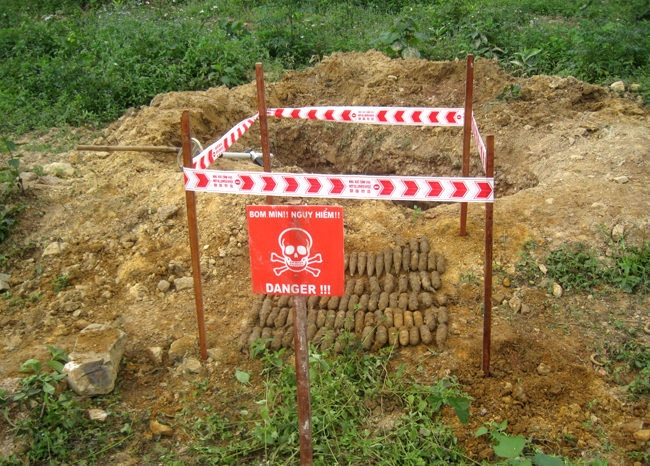 The past five years have seen a measurable reduction of UXO accidents in Quang Tri Province. However, the most recent accidents were mainly related to scrap metal scavenging. In 2014, Quang Tri recorded four accidents which resulted in eight injuries. Five of the injuries occurred in an explosion at a scrap yard as workers were loading scrap material onto a truck. It is essential to sustain public and school-based Risk Education campaigns to reinforce people’s awareness of UXO threats. UXO cleanup will have to continue for years to come in Quang Tri Province, but in the meantime Quang Tri residents can be safe, if they understand how to protect themselves and their families from injury and death and how to report munitions for safe removal and destruction.